Italian architect Andrea Morri has recently developed his submission for the OS House Competition. 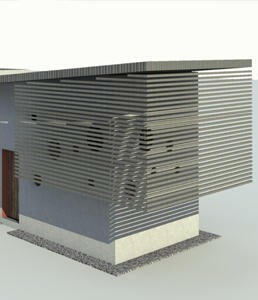 The project is an innovative and sustainable concept for housing in Ghana. For a person, the house is a shelter, a place where he looks for and creates a microcosm made of objects, affections and memories. Home also symbolizes the culture a person belongs to.The house prototype Morri proposes aims at creating a suitable living solution not just in urban areas, but also in rural or isolated areas and in emergency contexts.Covering is conceived to minimise the sun beating down through an internal ventilated gap and to make rain water collection easier during the copious summer rains. Besides containing water treatment pipes, the well between the kitchen and the bathroom also houses some PVC pipes for rain water, which is directly driven to the bathroom discharge or conveyed into storage tubs dug under the loose stone foundation. That way, rain water can be reused for household activities after being conveniently treated with the most innovative technologies.